J.R. Briggs becomes our first repeat guest in a different kind of sermon prep conversation. J.R. shares how he is learning and being challenged by Spurgeon’s words on sermon prep in his book: Lectures to my Students. J.R. Briggs is the founding pastor and cultural cultivator of The Renew Community, a Jesus community for the hungry and the hurting on the north side of Philadelphia. He is the founder of Kairos Partnerships, an organization that serves the hungry kingdom leaders through coaching, consulting, training and speaking. He’s had the privilege of serving organizations such as Christianity Today, ntwrightonline.org, American Bible Society, Operation Mobilization and a variety of other mission agencies, non-profits and Christian colleges. He also serves as adjunct faculty at Biblical Theological Seminary in Hatfield, PA. 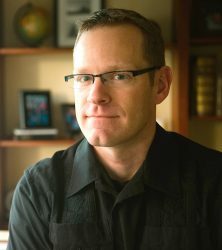 He has written and contributed to several books including Fail: Finding Hope and Grace in the Midst of Ministry Failure and Eldership and the Mission of God, coauthored with Bob Hyatt (both with InterVarsity Press). His next book Ministry Mantras (IVP, also coauthored with Bob Hyatt) will release in November 2016. J.R. and his wife, Megan, have two sons, Carter and Bennett, and live in Lansdale, PA.